If Thanksgiving dinner is your favorite meal of the year, now there’s a way you can extend the excitement without spending countless hours slaving away in the kitchen. Released by the somewhat controversial Salt & Straw, an Oregon-based, artisanal ice cream shop that is prone to real flavors, this seasonal Thanksgiving pints pack sold throughout November offers up the entire Thanksgiving meal in the form of ice cream. You may be wondering how that’s possible since turkey is a central part of the feast. Don’t worry, it’s there. One of the other important perks to Salt & Straws out-of-the-box ice cream flavors is that they donate one pint to a nearby food bank for every pint they sell. After all, everyone deserves to have ice cream. For the most adventurous among us, there’s a five-pint pack that includes the entire range of Thanksgiving flavors that start off as a fitting Thanksgiving twist to classic dessert flavors before diving right in to the taste of a main course. 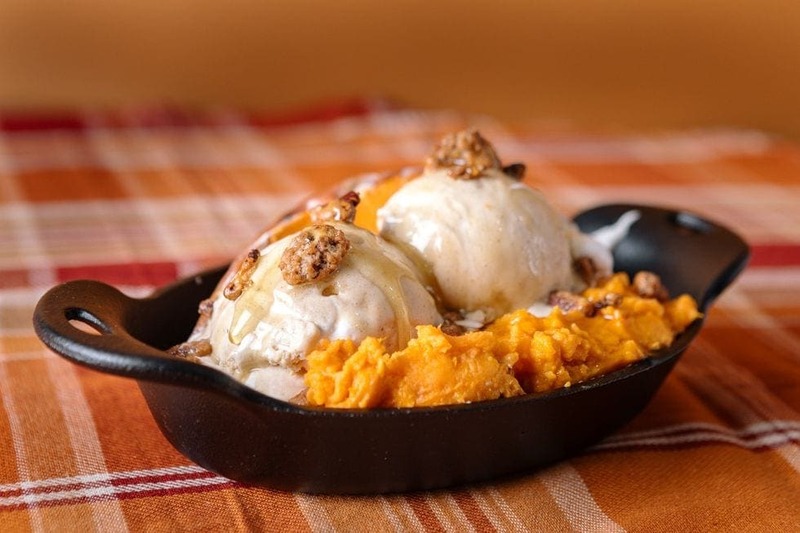 creamy sweet potato ice cream is decked out with ribbons of marshmallow fluff and maple syrup, while studded with crunchy maple pecans. Moving onto some lighter fare, there’s a dairy-free Cranberry Sorbet. This is no run of the mill frozen fruit concoction, as the experts employ cranberries in three ways: roasted, juice, and as jam. This is where it gets a little weird. 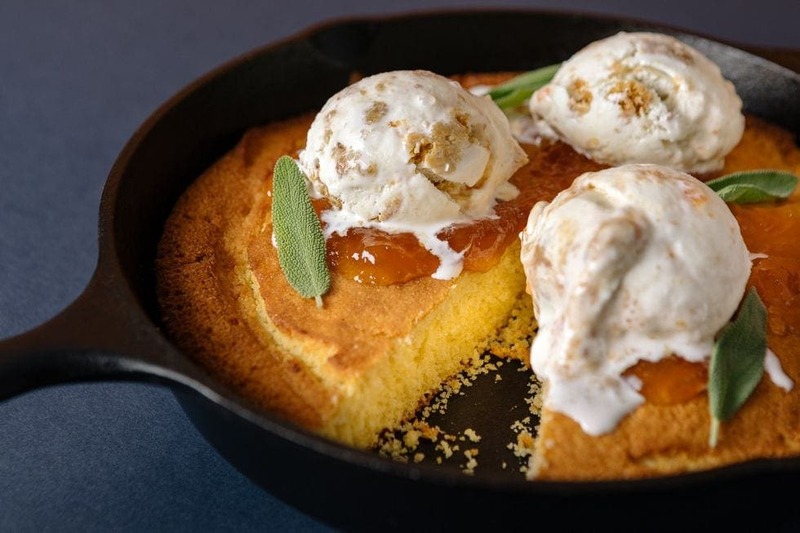 Bridging the gap between dessert and side dishes is the Roasted Peach and Sage Cornbread Stuffing. 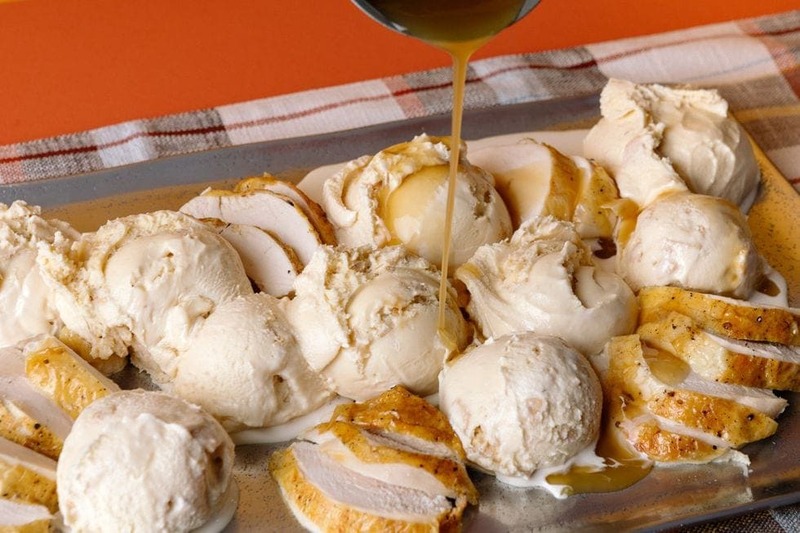 Rounding out the main course is the Salted Caramel Thanksgiving Turkey, which is better than it sounds, before being capped by a “dessert” of Spice Goat Cheese & Pumpkin Pie.